Integration Testing. Without a server. AND database? Yes, it can be done. In today's post, we demonstrate this awesome capability. Writing code can be tedious, but if you have the tools available, it can drastically improve productivity. Today, I cover five ways to generate code rapidly. Previously, I mentioned an acronym called TRIM for business objects. In today's post, we apply an Adapter Design Pattern to demonstrate the transformation of business objects. As your project grows, so should your documentation. Today's post revisits the One-Sheet, but with an Azure twist. As the second part of Codemash 2019, guest blogger Andrew Hinkle gives his review of this years' Codemash and the sessions he attended. Even though I had the Refactoring, First Edition, I had to have this book. 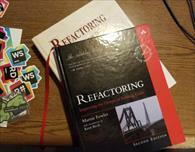 Today, I review Martin Fowler's Refactoring, 2nd Edition. How do you make Bootstrap easier? By leveraging TagHelpers. Today, we build a basic ASP.NET Core 2.2 Bootstrap Container TagHelper. This collection provides various sites for beginners to learn about ASP.NET MVC, both free and non-free.